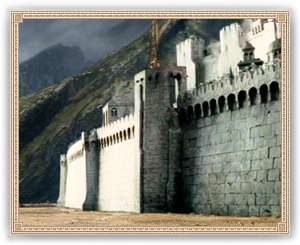 Main city wall of Minas Tirith. The main wall on the first level - called the City Wall or Othram - is especially high and thick. It is considered unbreachable and its hard, smooth surface is similar to that of Orthanc. The City Wall is described as "dark" and thus it may not have been made of white stone like the other walls of the City were.